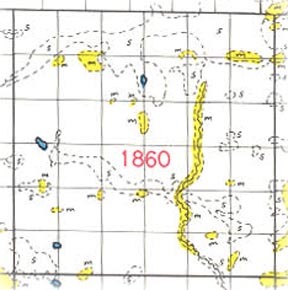 The citizens residing in the unorganized congressional townships now embraced within the civil townships of Homestead, Butler, Pine Lake and Corliss presented a petition to the county commissioners on July 26, 1880, asking for the organization of this territory, twelve miles square, into one civil township. The petition was rejected by the board on the ground that there was too much territory in the proposed township. Accordingly another petition was presented on the same day, having evidently been prepared with a view of providing for such contingency. This second petition called for the organization of a township comprehended within the present limits of Homestead township. Evidently the major portion of the inhabitants of the four congressional townships represented in the first petition lived in what is now known as Homestead township. This second petition was granted by the commissioners and the new township was given the name of Runyon at the request of the petitioners. The first election was held on the 14th of the following month at the house of Alfred Lane in section 28. The name of the township was later changed to Homestead by the order of the county commissioners. The second petition, July 26, 1880, contained the names of the following legal voters: G. D. Runyon, Levi Oberdrear, A. Harey, C. B. Fiske, W. B. Mitchell, C. T. Denison, A. O. Sherman, James Dunn, A. U. Taylor, N. E. McKee, Alfred Lane, Hans Christianson, David B. Williams, T. Murphy, S. G. Richmond, James Stolt, S. Runyon, I. Runyon, F. Shlers, Thomas Raon, A. J. Davis, H. Davis, John Galliger, H. C. Aitkinson and P. Downing. This is one of the few townships in the county without any lakes, although thirty years ago there were at least two lakes which appeared on the county map one in section 9 and the other in section 18. Bluff creek arises in the eastern part of the township and flows in a southerly direction leaving the township in the center of section 35. The surface of the township is generally level, although the northwestern part is quite rugged. There has never been a platted village in the township and the nearest approach to a village is found in the north central part of section 4. As early as 1880 there was a blacksmith shop at this point and a general store. The postoffice was established here and named Davies in honor of the merchant who handled the mail. The postoffice was discontinued many years ago and the township is now served by the rural free delivery. The present township officers are as follow: Supervisors, .G. A. Johnson, Math Lohi and Arno Poser; clerk, Frank Maasch; treasurer, Herman Kampsula; assessor, Roy Verbeck; justices, Math Jakola and A. J. Davies; constables, Vano Nervonen and Arthur Huldman. Places of birth for Homestead Township in the 1905 state census.